If you're among the lucky homeowners who received electronic equipment for the holidays-or if you're considering adding an entertainment center for the New Year-this is a good time to plan ahead for the project. It's nice to have a good home theater, video display, and sound system to retire to when you're pooped from your day job, or from doing work around the home. Of course, there are stand-alone units that you can have shipped to your home and installed. Prices range from around $1,700 all the way up to $4,000-and that doesn't count the electronics! Costs vary by the kind of materials (hardwoods costing the most), the pieces, and the hardware. For example, you can buy a six-piece pine set with TV stand, wine or CD tower, storage sides, and expandable bridge for around $3,900 delivered. Location, Location, Location When ordering and placing your surround sound speakers, there's a wide price range for cabinet speakers, bookcase speakers, floor speakers, and ceiling mounts. Do you already have a TV or monitor? You can easily find a surround sound system and speaker set that works well with what you own. The same goes for the cabinets and center. Entertainment center styles come in a complete range of options, from vintage to modern. If you're remodeling the den or family room, why not price a selection of sets that go along with your wall treatments, windows, doors, flooring, and carpets? Hooking Up to Outer Space If you're going to consider a satellite system to power your new entertainment center, there are a number of considerations. There are several satellite TV companies offering New Year deals on installation and service. Do you need more than 200 channels? 500 channels? Do you need digital video recorder (DVR) capability to watch your favorite programs at the time of your choice? In the age of high-definition (HD) broadcasts, you may want to find a satellite provider that offers the range of shows you plan on watching, from children's TV to sports or movies. 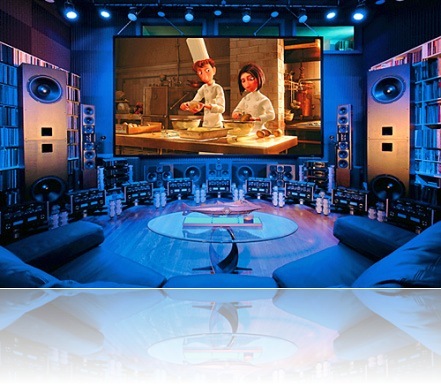 Be sure the companies you're considering offer installation and fine tuning for your HD programming. If you lack a line-of-sight view toward the satellite, you may want to either consider topping some trees or choosing a cable TV provider. Home entertainment centers can be the focal point of parties and gatherings of friends and families. Even though the holidays are over, you can create your own occasions to turn up the volume. If there's no room in your existing space for a center, consider a garage conversion. This entry was posted on Saturday, January 02nd, 2010 at 07:01 pm and is filed under Uncategorized , Remodeling , General Remodeling . You can follow any responses to this entry through the RSS 2.0 feed.